Size of Male: 12 lbs., 10 in. Size of Female: 12 lbs., 10 in. 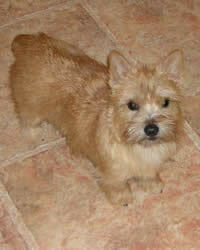 To the unsuspecting eye, the Norwich Terrier may look a lot like their close cousin, the Norfolk Terrier. The key to tell both apart is simple: look at the ears. The Norwich’s are alert and pricked. The breed is impressively sturdy for its size and makes an entertaining watch dog. Not much was known about ratting terriers in England until the late 19th century. Among those that surfaced were the short-legged Norwich Terriers. They serviced barnyards, flushed foxes and hunted in packs. About a decade after the emergence of this dog breed in East Anglia of England, America fell in love with the dogs. Records indicate that although this small dog breed was recognized by the AKC in 1936, it wasn’t until 1979 that the distinction between prick and dropped ears was made. Nobody really knows why these little dogs aren’t as popular as other canine pets of today, but what is known is that the pooches are stars in their own right in both the field and the show ring! This dog breed breed fits the general temperament of the terrier group. They are playful, feisty and energetic. They love to dig, bark and get physical. They also have a jealous side when it comes to their food and play things. Due to strong predatory and chasing instincts, it is best not to raise pet cats and hamsters when a Norwich has already sought refuge in your home. The breed tends to get along relatively well with other canines and is quite a darling with kids. Living Environment – These little dogs are suited for apartment living because of their minute size. It is worth noting, however, that their energy level benefits from either extra legroom for play or a regular walk. Take care that you do not neglect their need for socialization. Lonely homes breed destructive and unhappy dogs. Grooming – Allergic tendencies should not deter you from raising a Norwich Terrier. The breed doesn’t shed heavily and needs only weekly brushing to look presentable. For hygienic reasons, be sure to trim leg hairs as needed so that they will not touch the ground. Dogs intended for the show ring must have their hair stripped every 3 to 4 months by a professional groomer. Diet & Exercise – In general, a healthy diet for this dog breed consists of fish (which may be mixed with other protein sources such as beef or pork), potatoes and wheat. The dogs seem to have taken a liking for oyster shells over ordinary bones. It’s best to keep an eye on your pet’s diet for any possible dietary triggers though, as skin allergies are common in the breed. The Norwich requires moderate exercise on a daily basis. For the most part, a brief run or a long walk will suffice. Health – Among small dog breeds, this one is tough for a lapdog, boasting of an average lifespan of 13 to 15 years. Although eye and knee tests are encouraged, the Norwich is for the most part very healthy. Occasional cases of luxating patella, heart disease, epilepsy and collapsing trachea may be seen. In the dog training department, the Norwich Terrier would be considered moderately trainable. Their speed at learning new tricks is often checked by a rebellious streak. Just observe how the dogs behave, and you’ll see that they seem to really think for themselves! To ease the training process, adequate socialization, consistent methods and basic dog obedience training are strongly recommended.